Jam-packed with practical tips and tricks, generously shared by someone who’s been there before you. 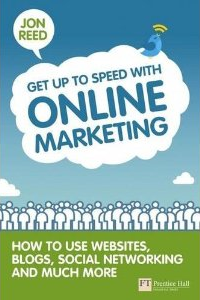 If you’re thinking about using websites, social media and other online tools to cheaply and effectively market your business but don’t know where to start, this is a great book to get you going. It’s not a technical handbook but it does help you navigate through the many potential tools and provides practical advice on choosing and using them for best effect. The author, Jon Reed, is a friendly and entertaining guide, always ready with a story or example to illustrate a point, always ready to point you in the right direction to get things moving. He constantly reminds you not to just leap in and use tools like twitter for the sake of it. Instead, he encourages you to think about your marketing aims and what you want to achieve – and then helps you choose the most effective tools with that in mind. Though I’m not quite sure I believe his “I am not a geek” claim, Reed always has the practicalities in mind. He keeps things as simple as possible, shows how online tools can make your life – and your business – easier, and understands the day-to-day challenges we all face: pressured time, limited money and (at least for some) a fear of using technology. This practical slant is reflected in the book’s emphasis on the use of third party tools: software, plugins and widgets that perform defined tasks (often for free) and save you the need to commission, brief and pay web designers or programmers. Of course you could find all these online tools yourself if you had sufficient time. What Get Up to Speed… does really well, though, is help you know what does what and what’s worth spending the time and effort to implement. Some of the best ‘takeaway’ points from the book are simple, but it’s unlikely you would stumble across them unless you’d tried all these things out yourself. Want to see how many people on Facebook are interested in your market or product? Sign up for Facebook’s paid-for advertising, complete all the fields and cancel at the last minute. It won’t cost you a thing but you’ll have got your data. Want to know how many pages on your website are indexed by Google? Enter mysite: and your business web address into the search engine, and you’ll also discover which pages are the most popular (in Google’s eyes anyway…). Want to make an online video of the PowerPoint presentation you’ve been slaving over? There’s an app for that: Camtasia. A book crammed full of useful tips and links like this could end up being a rather dense read. No chance! Reed has a lovely way with words. He counteracts the pressure to generate regular blog posts with a comparison to gardening (“You need to water your plants regularly – but you can leave them a while before they start dying”), provides tips on “how to avoid becoming a social media Stakhanovite” and drops in alluringly alliterative phrases like “multi-channel media milieu”. I interpret all this as a sign of his generosity. He’s spent years building up his knowledge and experience and now he’s ready to share it with the world. Not only that but he’s sharing it with style.